Category 5e 2-pair SF/UTP copper cable shall meet or exceed the IEC 61156-6, ANSI/TIA-568-C.2 Category 5e and ODVA EtherNet/IP standards up to 80 meters. The stranded copper conductors shall be 24/7 AWG with high density polyethylene (HDPE) insulation. The copper conductors shall be twisted in pairs and wrapped with a foam polypropylene tape to form a core. Both pairs shall then be surrounded by an overall braided shield and metallic foil and covered with a thermoplastic elastomer (TPE) jacket. The jacket shall be oil, sunlight, weld splatter, and abrasion resistant for enhanced chemical resistance and mechanical performance. The jacket shall be flame retardant (CMX/CM) for industrial Ethernet applications. 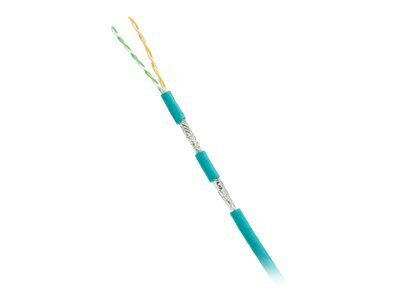 This cable is designed to support high-flex applications and is rated for panel or on-machine applications when the space is shared with 600 V high voltage power cables.